Coolster QG-50 50cc 2-Stroke Mini Dirt Bike, Front & Rear Disc Breaks, Super Fast! Everything was shipped with care and package arrived in time for Christmas. This bike is exactly as described, and goes as fast as expected. My kids love this little bike and ride it every day. I am giving this bike 5 stars, because any deficiency in its design is able to be determined before purchase. The fact that it is made in China and very cheap in comparison to other bikes is the first give away that this could be a poor quality bike. I am not calling it a poor quality machine though. I did my research and determined that all carburetor problems that I read about could be bypassed simply by using ethanol free gasoline. I have had no issues with a carburetor yet, except when my son filled it with water using the garden hose! I simply flushed and evaporated it with starting fluid to start it again. The issue with the pull start can be negotiated by permitting adults who are free of any mental retardation to pull the cord and return it to its starting position. The brakes have required frequent adjusting on one bike, but we crashed that one a few times and I would imagine that we can just determine that would be the cause of normal wear and tear. My only complaint is that the mounts on the top of handlebars of one of the bikes purchased was very much out of line, yet it still secured the handlebars tightly. If you do not know how to work on these things or are not willing to learn, you should not purchase it and you certainly should not put a child on it. If you fall in the category of experienced and willing to learn, this is a very fun bike for kids that are 70lbs and lighter. The bikes are easy to maintain, service, and modify. All the parts needed were in the box very little assembly required. The height is are weight are good for a small beginner. Would def buy this bike again. I got this for my son who's 7 and I tell you what, I wish I would have had one of these when I was his age! I love riding and I wanted to get Alex something that was lightweight, didn't go too fast and gave him the experience he needed to move up to a bigger bike. This bike from powersportsmax has done all of what I hoped and more, and has helped him to get a love of motorcycles just like me. Well done, well-made and highly recommended. I just received the 50cc dirtbike right on time. It was easy to assemble and runs great. I bought it for my 6 year old and he loves it. Great bike. Great value. Very satisfied. It shipped on time and came in perfect condition. Putting the handle bars and brakes on when we received it was easy and only took about 20 min. It rides great! Thank you! Great for the little guys. I am giving this bike 5 stars, because any deficiency in its design is able to be determined before purchase. The fact that it is made in China and ve ..
Coolster QG-50X 50cc Mini Dirt Bike with Automatic Transmission, Front & Rear Disc Breaks, 10" Tires! Super Fast! 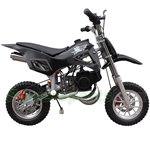 Apollo DB-21 70cc Dirt Bike with Semi-Auto Transmission, 10" Wheels, Kick Start! with Free Training Wheels! DOT Motorcycle Modular Open Face Helmet - Wineberry Free Shipping!